Inaugurated by the Governor Of Gujarat Her Excellency Kamalaji Beniwal. 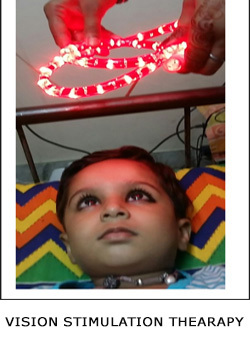 Low Vision Aid Center established at Dr. Thakorbhai V. Patel Eye Institute is to provide guidance and supportive aid devices to enable patients, suffering from Low Vision to lead an independent personal life which otherwise would not be possible. Dr. Thakorbhai V. Patel Eye Institute & Sheth M.L. Vaduwala Charitable Eye Hospital who have an outstanding track record to match its services with the ever updating technology to provide excellent eye care delivery to its patients in and around vadodara, once again come to you with a breaking news of establishment of “Low Vision AID Centre” equipped with AID equipments and managed by a competent trained technician. Severe vision impairment is said to be Low Vision. 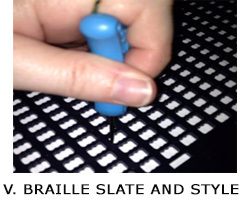 Visual impaired persons are defined as having vision loss which interferes with everyday living tasks eg. Reading a news paper or recognize faces and there is no conventional surgical or therapeutic treatment. It can affect child, young, or eve elder. Age related macular degeneration accounts nearly for half of all cases followed by cataract, glaucoma, diabetic retinopathy, optic nerve diseases and injury to the eye. Low vision has long been neglected society related sub specialty. But eye care professional have begun to recognize the wave of inevitability of new low vision patients that will be seen all over the world. Data available shows that visually impaired persons are increasing day by day and it is going to be triple by 2028. When we realize that less then 50% at the most may receive any low vision rehabilitation services, then the magnitude of both, the challenge and opportunity is obvious. As a result, low vision is becoming an important and recognized part of Health care. Low vision can affect everybody rich and poor, young-old still it is more commonly associated with older population of the society. 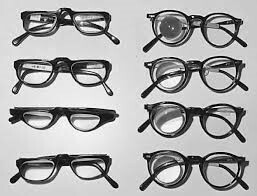 Visually impaired persons having varying degrees by medications, surgeries, or conventional glasses. It becomes difficult for persons with subnormal vision to perform their day to day routine work. 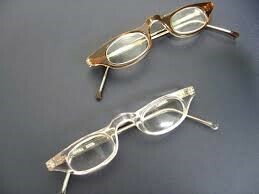 Low vision however does not mean absence of vision & losing vision also does not mean losing independence the basic principle of low vision aid is to provide magnification. Low vision patients do not recognize small & far off targets. When targets are magnified, their images cover more retinal area which may have more responsive visual receptors. Low vision services are geared to help patient to maximize the use of residual vision and make him/her function better & independently in everyday life. Though this eye institute was involved in pursuing low vision programme both for referred and hospital patients, a full-fledged low vision aid centre has now been established to expand functional area to include in house counseling and training to patients with low vision. 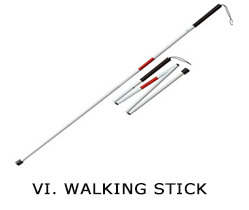 Orientation and mobility : Assessing mobility problems indoor and outdoor; teaching navigation skills with a sighted guide or cane; using appropriate non-optical devices like peaked caps, tinted glasses and flash light. Money identification : Techniques for identifying currency and coin. Personal Skills: Putting on make-up, shaving, matching colors of cloth, food identification, etc. 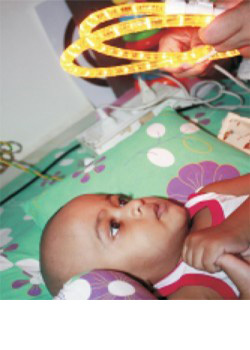 Early interventation services : In a growing child, lack of vision interferes with other normal development process. Early interventation services are targeted at children up to the age of five years, who have delayed development in the area of vision, motor, speech, and language, self care and cognitive abilities. The services include individualized assessment of functional residual vision and training in enhancing personal independence of the child from birth to five years age. Vision stimulation therapy : Special therapy to stimulate the functional residual vision of the child from birth to five years age. Environmental modification : Suggestions for modifying surrounding to maximize utilization of the residual vision. 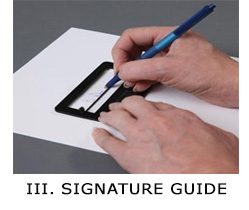 Non-optical devices : Instructional training including appropriate working distance, positioning and maintenance of non-optical devices such as reading stand, overhead reading lamps, color identifier, signature guide, letter writer, reading guide, bold ruled note books, felt pen/pencils and note for identifying currency. Follow up : Review of services to assess the utilization of rehabilitation skills imparted and further recommendation. 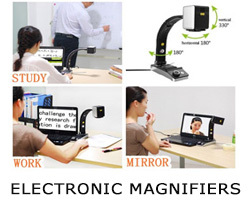 Distance vision telescopes are the only form of optical devices that assist a person with low vision with distance tasks, where conventional glasses are unsuccessful. 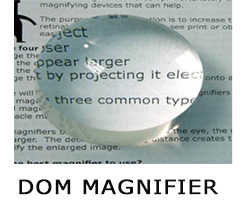 They improve the resolution of objects by enlarging the image, thus bringing the object closer (angular magnification). Telescopes can disrupt spatial judgment as the object appears closer than it is. 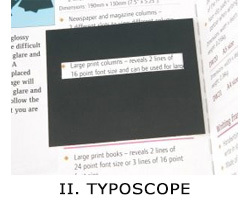 Low vision telescopes can be most useful if accompanied by a concentrated and careful instructional training program which includes localization, fixation, scanning and tracking. 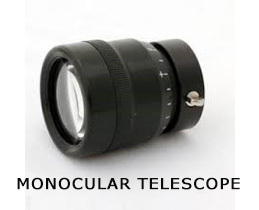 They feel psychologically more acceptable and can be more easily incorporated into one's daily life in comparison to a telescope. Spectacles are particularly useful for prolonged reading. They provide the widest field of view. 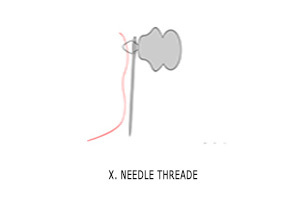 They require closer working distances, which may obstruct illumination and make writing difficult if the lens add is stronger than +10 D.
They are difficult to use for patients with eccentric viewing that requires eye/head turns as the working distance and optical centre is fixed. 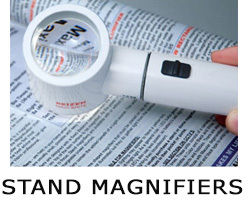 A stand magnifier is a convex lens mounted at a fixed distance from reading material the manufacturer to focus closer to the page than its focal distance, to reduce peripheral aberration. 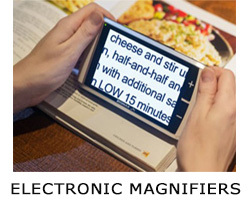 Most stand magnifiers are designed for use with a standard bifocal add or reading glasses. 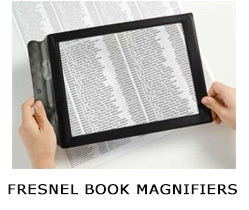 They are especially useful for patients who have difficulty in finding or maintaining the correct distance when using spectacles or hand magnifiers. 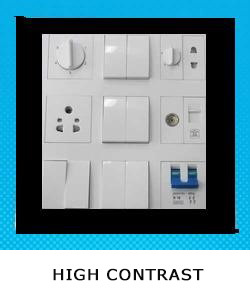 They are also available with a built-in light source, which can be highly effective in enhancing contrast. 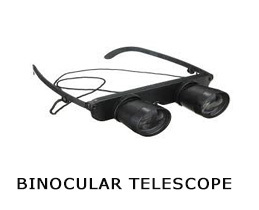 They have a limited field of view. They have limited mobility, being inconvenient to carry around. 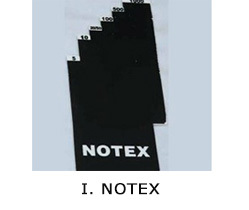 Reduced illumination in case of non illuminated stand magnifiers. 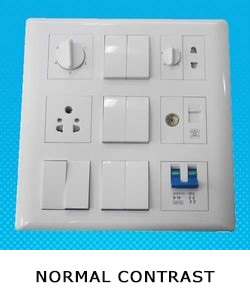 Most available designs make writing difficult, if not impossible. 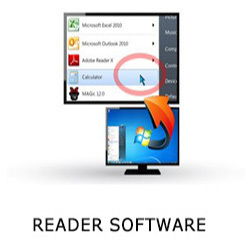 Prolonged use of these devices may result in poor posture, unless a reading stand is used. 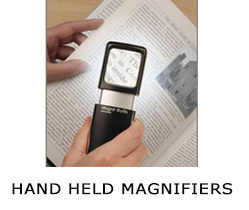 Hand-held magnifiers are convex lenses mounted with a handle so that they may be held in the hand rather than mounted on glasses. 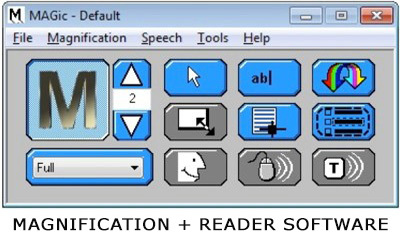 They can be used for reading at more customary distances in the low power range. They are easily assimilated into the normal daily life. 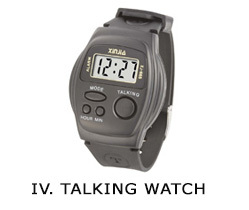 They are portable and provide a variable working distance. They must be held at the correct focal distance for maximum power. 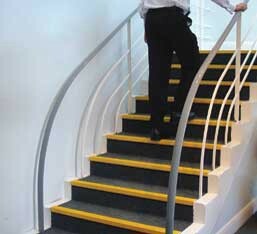 They can be difficult to use for patients with limited dexterity or hand tremors. 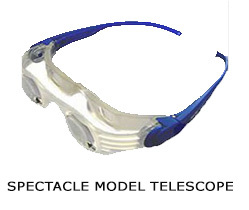 They provide a limited field of view in comparison to spectacles. Lending a professional hand in making each patient / parent understand the accurate prognosis of the ocular condition, discovering and addressing various implications associated with vision loss (social, psychological and functional) & encouraging special skills training. Training the parents and care takers in discovering and concentrating on the residual senses of the child to explore the world. If a child born with impairment sight so not knows they are supposed to see the world .Those who develop vision problem as young children may not have language to communicate information that could help defect this problem. Early professional intervention can make a major difference in your child`s development.